When Stampin' Up! first released their Letterpress plates, I wasn't really excited about them but I just love the one they introduced in the new catalog this year! I just inked the Lucky Limeade cardstock with Lucky Limeade ink and ran it through the Big Shot. 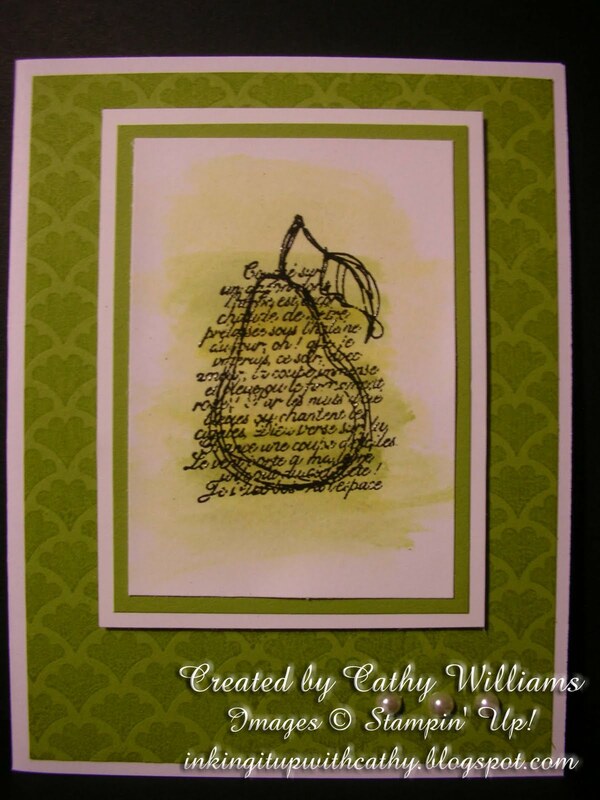 I embossed the pear image from the Faith In Nature hostess set (a bargain at $8!) 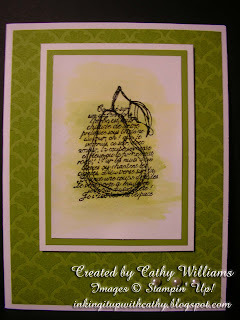 and then watercolored using Daffodil Delight, Pear Pizzazz and Lucky Limeade. I added a few pearls and came up with this beautiful card! Do you ever have trouble getting your pearls or rhinestones spaced evenly? Here's a little trick - use your mat pack. The pearls and rhinestones fit perfectly inside the largest holes and you can get them lined up perfectly straight on your card. UPDATE TO POST (5/29/14): Several people have asked how to get one of these mats to space out your pearls and rhinestones. The mat shown was retired by Stampin' Up! a couple years ago but can be found on online auction sites. However, I thought I would show you how to make your own. Here's what you will need: Crop-a-Dile, window sheet piece, Cardstock piece to draw pattern on, ruler. The holes in Stampin' Up's mat are 3/8" apart. Measure and draw a straight line along one side of the Cardstock piece. Next, measure and draw 3 or 4 lines perpendicular to the other line, making each line 3/8" from the other line. 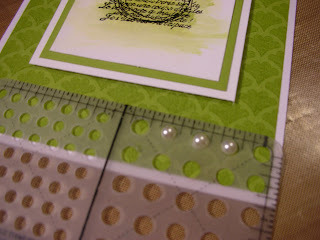 Lay the window sheet over the top of the Cardstock and punch out where the lines cross, making sure it is centered. Now you have a clear piece to add your pearls or rhinestones. Note that the pearls are the same size as the punched hole so you will need to be careful lifting the sheet off after placing your pearls/rhinestones. I have received so many requests for these mats (which are no longer available except on eBay or other sites) so I have updated this post with how to make your own. Try it and let me know how it works for you.